Hold me, Touch me: [locking the door to Max's office] Let's fool around. The Producers(1968) has three things that make it a pleasurably funny film. One, the humorous interreactions between Gene Wilder and Zero Mostel. Two, the film's memorable and unforgettable "Springtime for Hitler" musical number. Three, the energetic and fresh style of the filmmaker, Mel Brooks. Mel Brooks does a fantastic job in his masterful film debut as film director. Blends the crude humor of Blazing Saddles(1974) with the subtleness of Young Frankenstein(1974). Brooks's direction is daring and isn't afraid to use material that might be a little risque. I believe Mel Brooks direction in The Producers(1968) is excellent and surpassed only by his more mature direction for Young Frankenstein(1974). The screenplay is terrificly good for a comedy of this kind. Perhaps the best written film by Mel Brooks in his directorial career. Boasts some original lines of dialogue and strange situations. The film's screenplay received an Oscar for Best Original Screenplay(too bad The Producers wasn't considered for Best Picture or Best Director). Gene Wilder was the best alter ego as actor to Mel Brooks as director. He was in the director's three top films and that is no accident because Gene Wilder always added more laughs to the films of Mel Brooks in which he was in. The Mel Brooks pictures where Gene Wilder wasn't in lose a lot with the lack of his presence. In my opinion Gene Wilder worked with Mel Brooks in a way the director has not worked with anyone before or since. 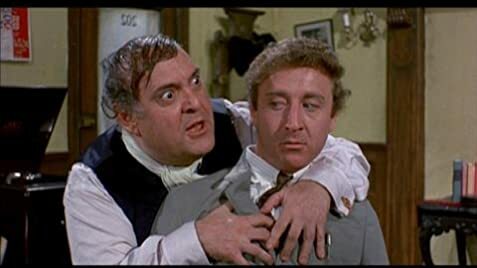 The characters of Zero Mostel and Gene Wilder are opposites in personalities yet they make a perfect duo. The two leads give brilliant performances in their roles of Max Bialystock and Leo Bloom. Two is a number that plays an important role in many of the Mel Brooks films. In his films there is a leader and an assistent whose plans never work as originally envisioned. A satire on planned failure and unintentional success that was daring for its time. Deals with how a bad or below average product can be popular due to good fortune. In the film, Max and Leo attempt to produce a failure on Boardway to collect the insurance. To their chargin the play becomes a big time success. The main idea of the story was eeriely prophetic because today there are many lousy films that are big box office successes. The Producers(1968) message was that people will go to see anything even if the product isn't very good or excellent. Its funny to see how truthful The Producers(1968) was in portraying a certain element of human nature. To see films like Blair Witch Project(1999) or other lousy big hit films become successes shows that The Producers(1968) in one way was ahead of its time. I have no intention of watching the Boardway play based on the film for several reasons. One, the actors in the play do not bring the same type of humor or style of Zero Mostel and Gene Wilder. Two, the story worked much better when written during the late 1960s. Three, anything that has been inspired from film into Boardway usually turns out to be not very good at all. Kenneth Mars rounds out the main cast in a hilarious turn as Franz Liebkind. One of the best sequences is when Max flirts with old women to get their money. The final scene is another brilliant moment in The Producers(1968). The set designs are beautifully constructed and visually depicted. William Hickly makes an obscure appearence in a film before his breakthrough role in Prizzi's Honor(1985). The Producers(1968) is Mel Brooks at his best and most enthusiastic. I can tell the film was made in the late 1960s because of the manners and style of the characters. A classic comedy made at a time when the cinema took chances and weren't afraid to use its artistic freedom to the fullest extent.